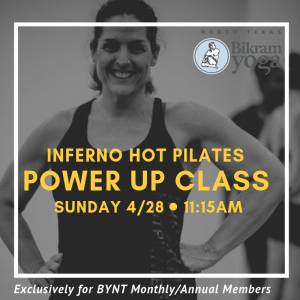 This special event is exclusively for Bikram Yoga North Texas Annual Members and Monthly Auto Pay Members. IHP Fans – are you ready to experience MORE time under tension, MORE combinations, and MORE results? Join us for this special IHP Power Up class. The class will follow the same principles you know and love, the difference will be in the timing and they way moves are combined. All skills levels welcome. Not sure you’re ready? You are! Rest when you need to rest. Join back when you can. Variations are provided for every exercise. Do the best you can with the best you have! Click here to hold your spot. Not a BYNT Annual or Monthly Auto Pay Member? There’s no better day than today to sign up. Inquire at the front desk for details. 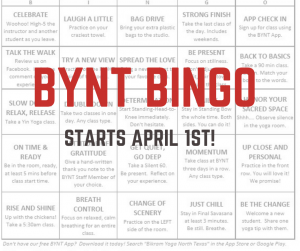 Join us for BYNT Bingo, April 1st – 30th at both studios. Bingo is a fun way to focus on specific elements of your practice and enjoy your BYNT Community. You can start on April 1st or any time through the month. Pick up a Bingo card in the lobby. Put your first and last name on the Bingo card. Each Bingo square includes challenge or focus point. Mark one Bingo square for each class taken. If you take two classes in one day, mark two squares that day. Let the Front Desk know when you achieve single line Bingo (across, down, diagonal). Your name will be entered in our Weekly Prize drawing. Grand Prize drawing May 1st from students who achieve Blackout. For this round of Bingo we have a square to fill out a “Favorite Posture card.” Cards are available next to the Bingo cards. If you aren’t sure of the name of your favorite posture ask an Instructor, Staff Member or fellow Yogi. We highly encourage using charade move, which is helpful and also entertaining.